Today, nothing remains of Charles Goodall’s Camden Works, where three-quarters of the playing cards printed in Britain were produced. The founder of the dynasty, Charles Goodall (1785-1851), came to London from Northampton, as a child. 1801 He was apprenticed to J. W. Hunt, an old and established playing card manufacturer. 1820 The Goodall business was first established in Soho, printing playing cards and message cards. The earliest cards were traditional in appearance, and resembled those of Hunt. 1830s The firm expanded into premises in what was then Great College Street. The main factory lay behind the terrace in a building which had formerly been a gun factory and was later used for the production of steam engines. At around this time, Goodall started experimenting with 'modernised' and other court card designs which gradually evolved into those we are familiar with today. Charles’ two sons joined the family firm. By the middle of the century, Goodall and its younger competitor Thomas De La Rue, were between them producing two-thirds of all playing cards made in England. Fifty years later, Goodall and Son were leading the market with annual production of over 2 million packs. Demand was outstripping production, and new premises were secured nearby. 1868 From the new factory, an additional range of high-quality stationery was launched, plus games, toys, fountain pens and even toilet paper. 1879 New presses added a wide choice of multi-coloured calendars, Christmas and greetings cards and almanacs. c.1880-1885 Goodall absorbed the firm of Reynolds and Co, acquiring their stock and equipment. Goodall made cards for Victor Mauger in the USA, and the designs were also copied by American manufacturers. 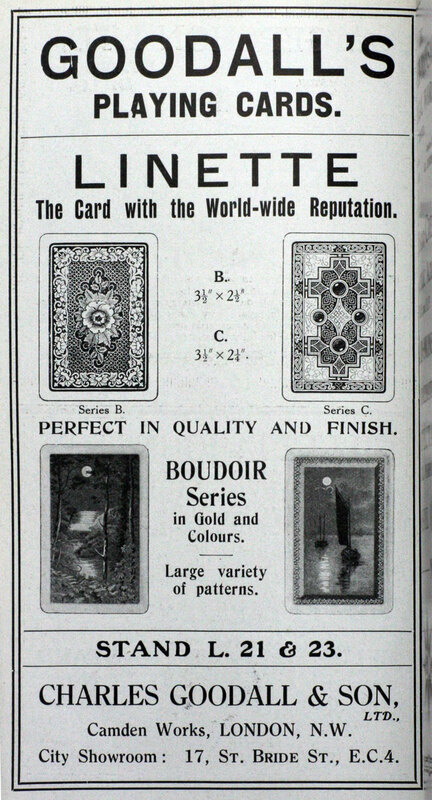 c.1885 Goodall set up London Playing Card Co, a subsidiary outlet for lower grade cards. Special Aces of Spades were used: Goodall also produced many special Aces or Jokers for advertising. 1898 The company became 'limited', and this change was reflected in the lettering on the Ace of Spades. 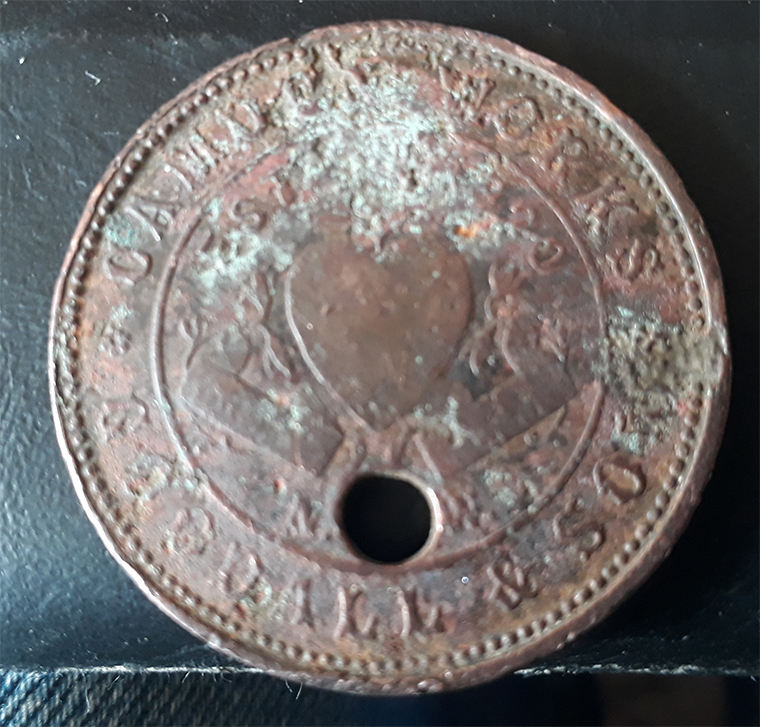 1922 Charles Goodall and Son was merged with De La Rue. 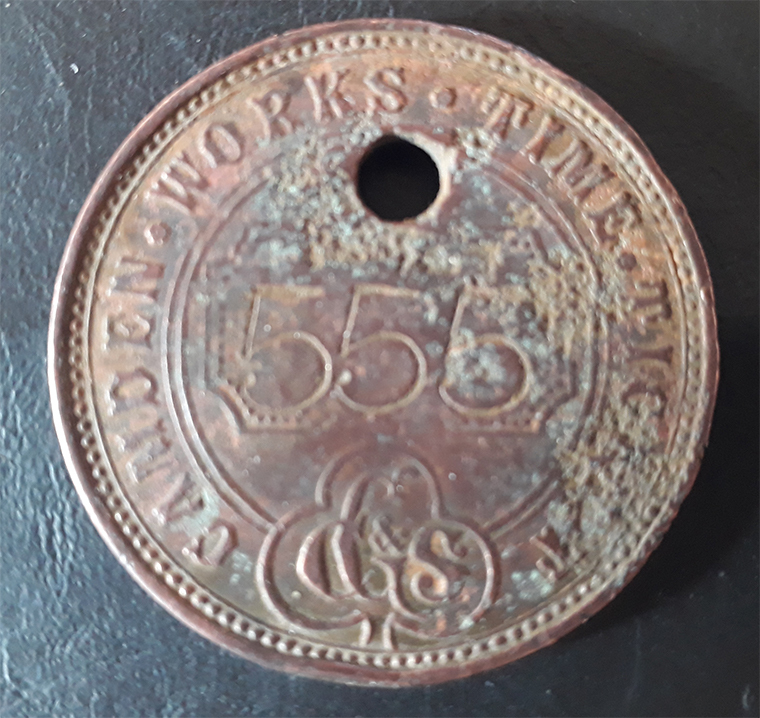 c.1929 The Camden Works were kept open until around 1929, and the Goodall name and brand names were still used until much later. Subsequently, the old buildings became run-down, were purchased by The Post Office and partially demolished in the mid 1970s. Over the years, because of their great clarity and beauty of design, these designs have been adopted or copied by manufacturers around the world. For example, they can be found on standard playing cards made in Italy. This page was last edited on 11 February 2019, at 00:35.